3.3 What is the difference between indicators and performance measures? 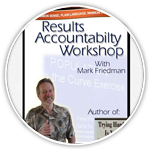 How do Results-Based Accountability fit together? Indicators are about whole populations. Performance measures are about client populations. 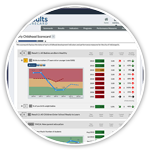 Indicators are usually about peoples’ lives, whether or not they receive any service. 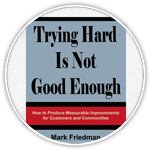 Performance measures are usually about people who receive service. Indicators are proxies for the well-being of whole populations, and necessarily matters of approximation and compromise. Performance measures are about a known group of people who get service and conditions for this group can be precisely measured. (1) Why is this important? We have a long history of holding individual agencies responsible for population well-being. No one agency, by itself can turn the curve on any indicator. It is unfair and unproductive to hold a single agency responsible. We need to reframe the way we talk about accountability for whole population results and indicators. Rather than say: “The Health Department is responsible for “all children being healthy.”We need to say “The Health department is responsible for assembling a team of public and private partners and creating a community strategy to make all children healthy.” The difference here is not just phrasing. It is the difference between having one agency to blame when things go wrong and accepting joint responsibility. It is the difference between expecting the Health Department to do it all by itself, and recognizing that this is not possible, that the contribution of many partners will be required. (2) The disciplined distinction between indicators and performance measures is a new idea for many people. They are used to using the word “indicator”interchangeably to describe population and program measures. Using language discipline to distinguish them, indicators are measures which help quantify the achievement of a result. Performance measures are measures of how well public and private programs and agencies are working. Performance measures are about clientpopulations. Indicators are usually about peoples� lives, whether or not they receive any service.